With about 20 skeletons on display, the “Giant Mysterious Dinosaurs” exhibit was smaller than I had expected. 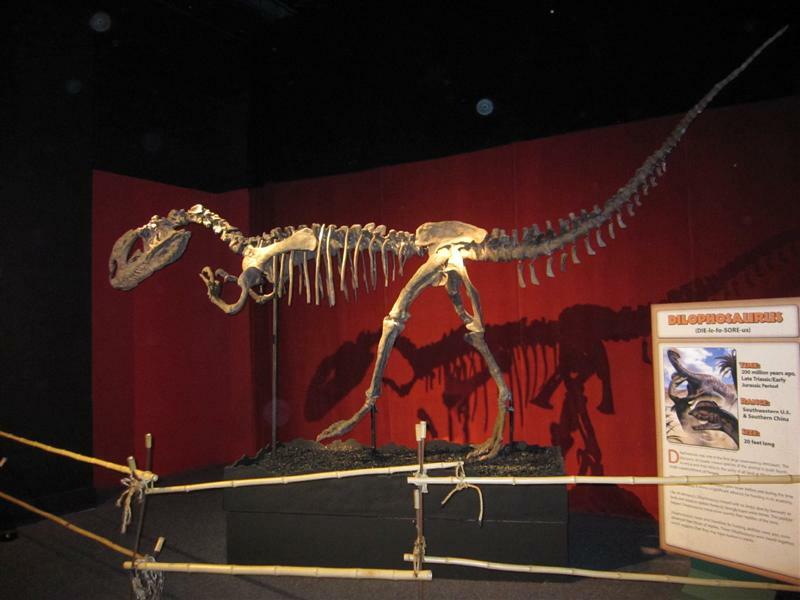 Nonetheless, the kids got a kick out of seeing the 50-foot Mamenchisaurus skeleton and the three robotic dinos; a Protoceratops and two Saurolophus. Lots of kids (although not ours) swarmed the Gobi Desert Dig Pit to search for fossils. The Girl was too busy stomping on the floor pad in front of the Mapusaurus to make it growl. I swear I took this photo before I saw the “no photography allowed” sign. Swear. 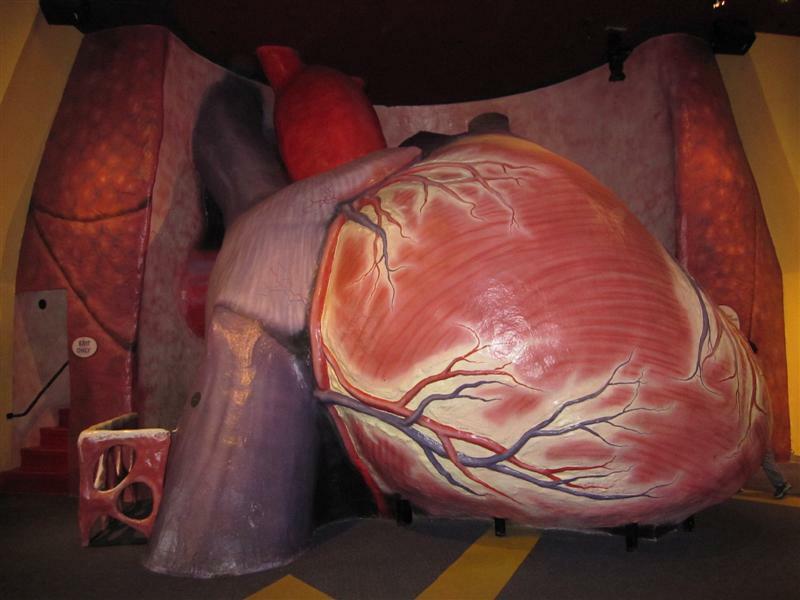 The giant walk-through heart – the largest of its kind in the U.S. – is two stories high, and would be the correct size for a 220-foot tall person. The journey through it involves some stair climbing, and the path is a little claustrophobic. Although there is informative signage, and great sound and lighting effects to demonstrate the physiological processes of a pumping heart, it was all a little overwhelming for The Girl. She couldn’t wait to get out. What she liked the best wasn’t even on our radar initially. 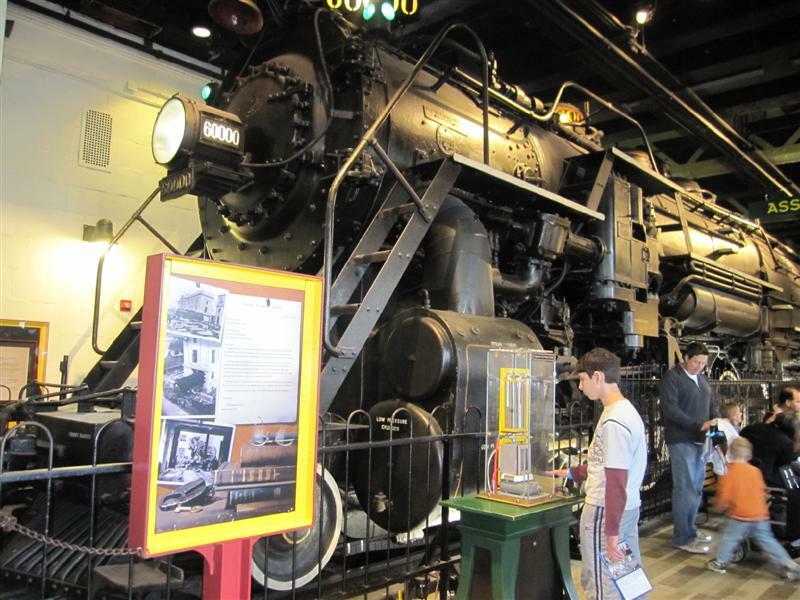 The Train Factory houses the 350-ton locomotive Baldwin 60000, one of the largest ever built. This is a real train, and it is HUGE, especially when looking up to the top from the ground. Built in the late 1920’s, the Baldwin 60000 was designed as a prototype for a new generation of steam locomotives. It turned out to be a bust. Its design was too complicated for engineers and firemen to operate. At 350 tons, it was also too heavy, and damaged miles of track on a 1927 tour across the U.S.
We waited on line to board the engine car with a small group. 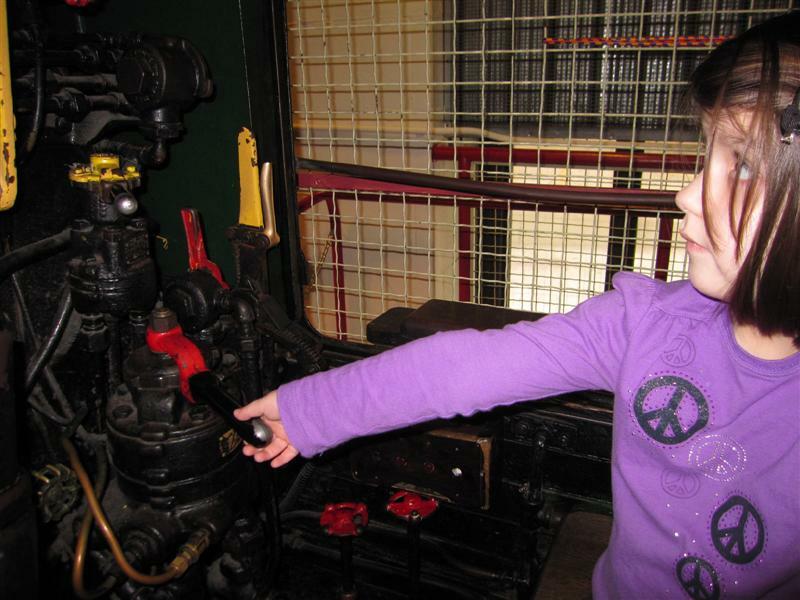 The Girl and a few other kids happily took over at the controls, pretending to add coal to the fire, blowing the whistle, and releasing the throttle. The train really moves – albeit really slowly — 15 feet back and forth. She's -- naturally -- most comfortable at the controls. What’s great about the Franklin Institute is each section has a distinctive theme, so you can identify areas where you want to spend time based on your interests. If you have pre-schoolers, check out KidScience. Athletes? Go to the Sports Challenge exhibit. 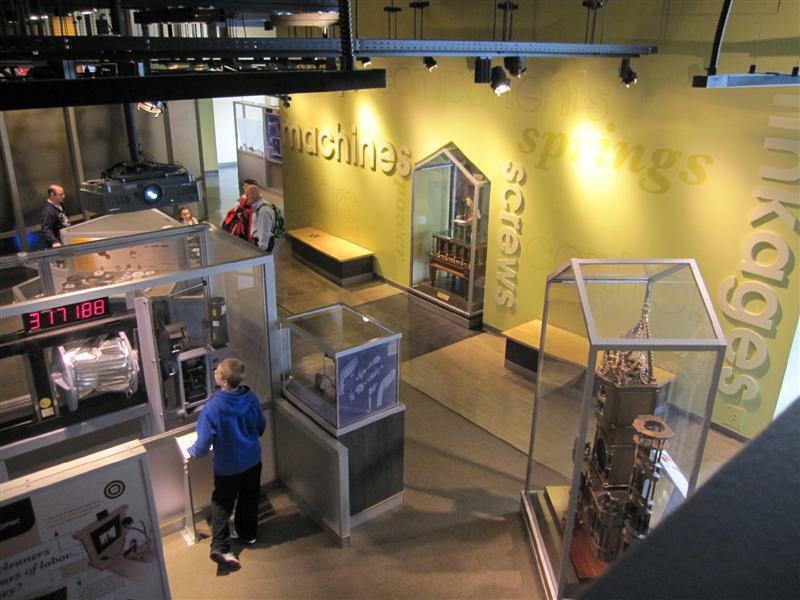 If your kids love to tinker and figure out how mechanical objects work, check out the Amazing Machine section. This was The Boy’s favorite area. There is a real automaton on display, very similar to the one in the movie Hugo, which we had just seen. 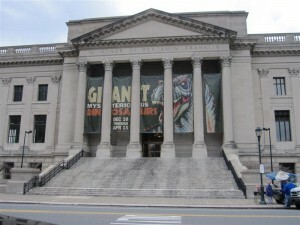 Disclaimer: We received complimentary admission to The Franklin Institute from the Greater Philadelphia Tourism Marketing Corp.
Hi Traci, Living vicariously through your GBOGH blog is a real joy for me. Thanks! I’m with your daughter…the walk-through heart is kind of creepy, but I do like the train! You could probably crush a whole stack of pennies at a time under those wheels! No mention of Matt in this post??? Whats up, no Dunkin Donuts nearby so he didn’t make the trip?